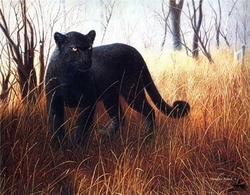 Home > Other Artists > Charles Frace "Powerful Presence"
Charles Fracé, a wildlife artist whose work was featured in more than 450 exhibitions, was born in 1926 in the small town of Mauch Chunk (now Jim Thorpe), in eastern Pennsylvania. He began drawing at five and taught himself to paint when he was fifteen. His self-instructed talent earned him a scholarship to Philadelphia Museum School of Art, where he graduated with honors. In 1955, Fracé began a professional career as a freelance illustrator in New York City. After struggling to land his first paid artist job, he eventually became one of the nation's most sought-after illustrators of wildlife. At the urging of his wife Elke, Fracé took a sabbatical from commercial illustrating in 1972 and began painting for his own enjoyment. He proceeded to paint from memory an American eagle he had observed at Walking Dunes on the coast of Long Island. Unsure that the painting represented how he really felt about wildlife he put the painting into storage in a closet. His wife took the painting to a gallery in Mattituck seeking a professional opinion and with the urging of the gallery owners left it with them for display. It sold in two hours. In 1973, he left the world of commercial illustration and concentrated on producing wildlife oil paintings. Also that year he started a business relationship with a publisher of wildlife prints. His first two limited edition print releases sold out shortly after release. During the next 20 years over 100 of Fracé's paintings were issued as limited edition prints, making him one of the most successful wildlife artists of all time. In 1993 the Smithsonian Institution's National Museum of Natural History in Washington D.C. hosted a one-man exhibition of his work that featured over 36 of his paintings.